If you are one of the lucky parents who can still bring "homemade" treats to school for your childs School Halloween party, these cupcakes are an adorable treat to serve your child's class! If you are like me you may just have to make these creepy creations, which start from store-bought or homemade cupcakes, for your Halloween party off school property =). 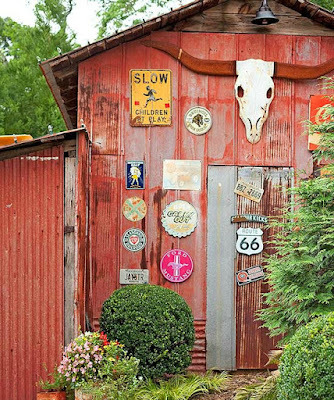 This black cat is anything but bad luck! Using purchased or homemade cupcakes in any flavor, frost each cupcake with chocolate frosting. 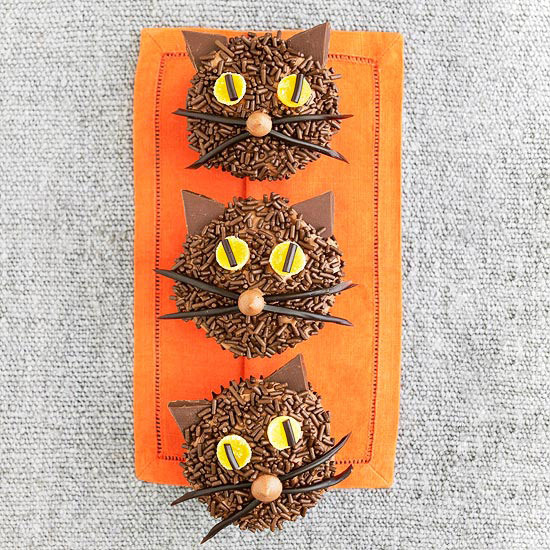 Cover the cupcake with chocolate sprinkles; be generous to give the impression of fur. For eyes, cut a 1/8-inch-thick slice from the large end of two yellow gumdrops. Stick a short piece of shoestring licorice to the cut side of each slice to act as the cat's pupil. Press the eyes into the frosted cupcake. For ears, use a paring knife to cut chocolate candy coating dots into triangles. 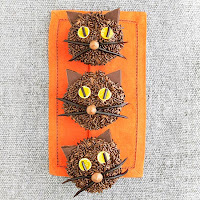 Insert ears into frosting on cupcake.For whiskers, cut shoestring licorice into 1-1/2- to 2-inch lengths and arrange on cupcake. Pipe a frosting nose. This coconut-topped Halloween cupcake looks totally "wicked".To make the cupcake, follow these steps:Use black marzipan to shape the witch's boots.Stick yellow mini candy-coated chocolates on each boot for the buckles using frosting to secure. 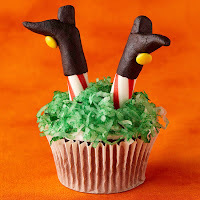 Mold each boot around a peppermint stick to create the legs.Top the cupcake with coconut dyed using green food coloring. Insert peppermint sticks into the cupcake. 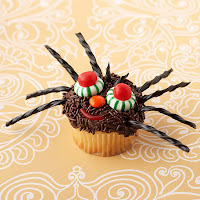 This frightful cupcake is sure to be a monster hit at your Halloween get-together. To make the cupcake, follow these steps:Insert sour candy corn in the frosting for hair. Cut one thin candy wafer in half and place at the top of baking cup for eyes. 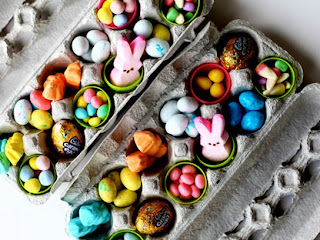 Use frosting to stick two blue mini candy-coated chocolates to thin candy wafer for pupils. 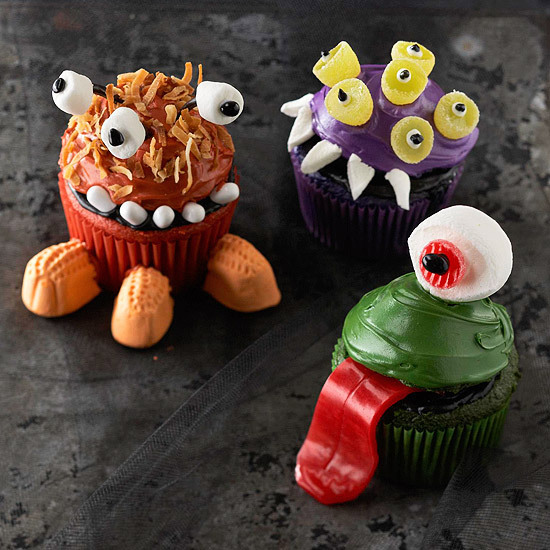 These monstrous Halloween cupcakes,made with frosting, gumdrops, and fruit leather, are the perfect treat. To make cut the rounded tops off cupcakes. Frost cut surfaces of cupcakes with black frosting. Place a large gumdrop half in the center on top of each cupcake. Spread green, orange, and purple frosting over cupcake tops as shown. Place frosted tops over gumdrop halves on cupcakes, tipping each top back slightly to form a mouth. For eyes, attach a small piece of black candy to a slice of marshmallow; insert a small piece of black licorice into bottom of marshmallow slice. Press into cupcake. 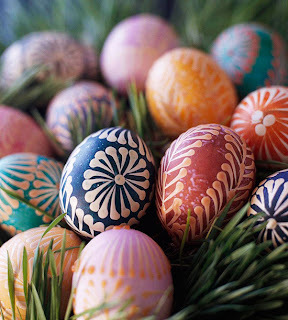 (Or make eyes from gumdrop pieces and small black candies and/or marshmallow halves, gumdrop pieces, and small black candies.) For teeth, cut marshmallows into pieces or use white small oval mints. For tongues, lay a fruit leather roll flat; fold and press together to make four layers. Use scissors to cut out tongue shapes. Attach candy circus peanut pieces to the fronts of cupcakes for feet. This eight-legged cupcake cutie sports a friendly grin for any festive occasion. To make cover a cupcake with chocolate icing and sprinkles. Attach sourball halves to circle mints using icing. Place the eyes and a chocolate-candy nose onto the cupcake.Form a smile with a small piece of red licorice. Use eight long slivers of black licorice for legs and two short slivers for pinchers; cut into points and insert into cupcake. 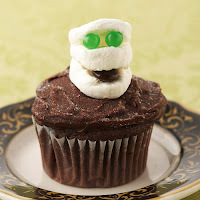 Slices of marshmallow create a cute mummy cupcake you won't be able to keep under wraps for long.To make the cupcake, follow these steps: Dust a frosted cupcake with granulated sugar.Place three slices of marshmallow on top of the cupcake for the mummy's head. Place two small mint candies between the top two marshmallow slices for eyes, using frosting to attach.Put a candy-coated chocolate between the bottom two slices for the mouth, using frosting to attach. This chocolaty goblin cupcake, made with sour candy and jelly beans, will be gobbled up in a flash at your next Halloween bash. To make the cupcake, follow these steps: Cut or tear sour gummy straws in half and insert them into a chocolate frosted cupcake for the goblin's hair. Use sour gummy rings for eyes. Put a white jelly bean in each ring for eyes and top with a mini chocolate chip (or dab of chocolate icing). Place a green jelly bean under the sour gummy rings for the goblin's nose. 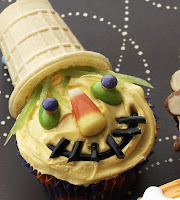 With an ice cream cone hat and a candy corn nose, this tasty scarecrow is better suited for eating than for protecting the fields from scary birds.To make the cupcake, follow these steps: Snip green fruit leather into thin, short strips and place on top of the cupcake for hair. Place a piece of candy corn in the center of the cupcake for the nose. Put a jelly bean on each side of the nose; attach a mini candy-coated chocolate to each jelly bean eye using a dab of frosting to secure. Curve a piece of black string licorice into a smile below the nose. Place small pieces of licorice across the smile for teeth. Attach a wafer ice cream cone to the cupcake for a hat. 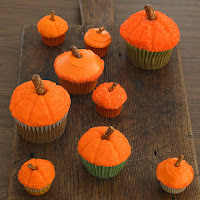 With such a simple design, these pumpkin cupcakes can be made quickly for any Halloween event on your calendar. To make the cupcakes, follow these steps:Frost cupcakes with orange frosting and dust with orange sprinkles.Use a wooden skewer to draw pumpkin veins radiating from the center to the outer edge of the cupcakes.Break large pretzel rods into small pieces and stick into the top of the cupcakes for stems. 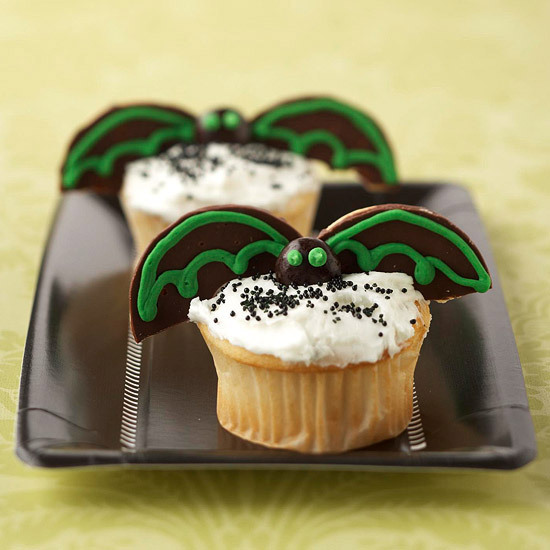 Everyone will go batty for these chocolaty Halloween cupcakes. A cookie, candy, and some creativity are all it takes to make these tasty treats.To make the cupcake, follow these steps: Cover the cupcake with chocolate or colored sprinkles. 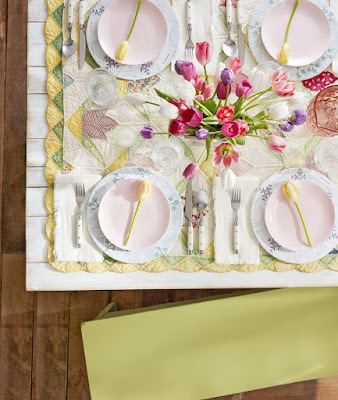 Break a chocolate cookie wafer in half; use purchased green icing to create wings on each piece of the cookie wafer. 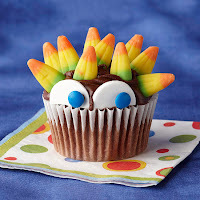 Place a candy-coated chocolate in the middle of the cupcake for the head. Make two dots for eyes using green icing. Stick the decorated chocolate wafer halves on each side of the head for the bat's wings. 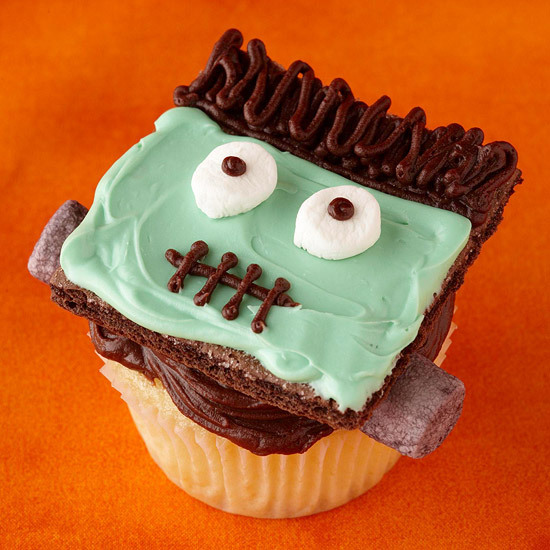 Freak out the crowd with this spooky Frankenstein cupcake. To make the cupcake, follow these steps: Ice a chocolate graham cracker square with tinted green frosting, leaving room at the top for hair; place on top of a frosted cupcake. 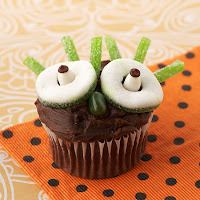 Use chocolate frosting to make spiky hair and Frankenstein's mouth. Cut a small marshmallow in half for the eyes. Dot chocolate frosting on each marshmallow for pupils. Place a dyed marshmallow on both sides of the cupcake for bolts.